The escalating demand for air travel, massive backlogs of new aircraft orders and a gradually resurging business jet sector, portrays a stronger outlook for the industry. However, under the banner are signs that the industry is undergoing a shift that will witness significant consolidation within areas of the supply base and downward pressure on profits as the original equipment manufacturer (OEMs) ramp up production of increasingly advanced platforms. Crafting strategies and techniques to utilize existing IT infrastructures and advance technologies like cloud and artificial intelligence, while maximizing support from external vendors, is key to developing future-proof IT platforms. These platforms will then be capable of supporting the business and its growth opportunities. Currently, the aerospace industry conjures pictures of massive technologically advanced companies breathing life into engineering that are capable of zooming across the sky. These companies are continuously bringing in upgraded operational efficiency, advanced avionics and impressive interior cabin designs and noise reduction capabilities, driving increased customer demand. At the same time, utilization of advanced manufacturing technology and conversion to new electrical systems by these companies are swiftly transforming the way aircrafts are manufactured. This is prompting the supply chain to make the changes necessary to keep up with aircraft OEM demands. To speed up the progress, it is important for the industry to share their intellectual properties more openly, move to adapt as many standard manufacturing tools as possible, and engage with software vendors as strategic business partners. In our selection, we looked at solution providers who have created out-of-the-box solutions that address the unique requirements in the space. A distinguished panel comprising of CEOs, CIOs, VCs, analysts including CIO Review editorial board has selected “20 Most Promising Aerospace Solution Providers 2016”, listing the best vendors and consultants who provide key technology solutions related to aerospace vertical. 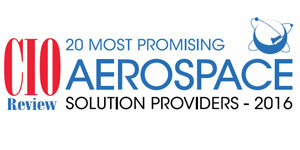 We present you CIO Review’s 20 Most Promising Aerospace Solution Providers 2016. Certon Provides safety-critical systems, software, and ensures electronic hardware certification. CHEP Undertakes specialist services for the aviation industry including asset management, supply, maintenance and repair solutions. Component control A leading developer and provider of MRO, manufacturing, and logistics Software solutions for the aviation industry. DASI Solutions A leading supplier of 3D CAD product design engineering software. General Dynamics A global aerospace and defense company. iJet Technologies Provides cross-functional data management and analytics platform for airlines. IQMS Offers powerful ERP software that enables manufacturers to operate more efficiently and profitably. Marana Aerospace One-stop-shop for reliable, full-service MRO aircraft maintenance. Matchbyte A provider of customizable high quality low-cost airline software solutions. Pentagon 2000 Software Provides integrated solution to support clients in heavy aircraft maintenance, parts, components and raw materials Distribution and Brokerage, and depot level maintenance and line maintenance. Plex A cloud-enabled ERP solution provider for manufacturers of all sort. Quantum Aviation Solutions Provides comprehensive, flexible baggage tracking and management solutions to airports and airlines that helps organizations to achieve unremitting workflow. Rootstock Software Provides manufacturing and supply chain solutions built on the Force.com cloud computing platform. Supply Dynamics Provide technology, processes and solutions designed specifically to address the challenges of managing sourcing, procurement and supply chain complexity in highly distributed manufacturing environments. TransDigm Supplies innovative solutions to aerospace applications for original equipment manufacturers and aircraft operators. UTC Aerospace Systems Suppliers of technologically advanced aerospace and defense products.